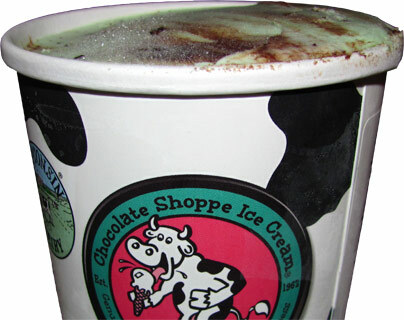 [By Nick] After Caramel Chaos not living up to my expectations of being a caramel overload, I was wondering if Chocolate Shoppe would be able to meet them with a mint flavor. 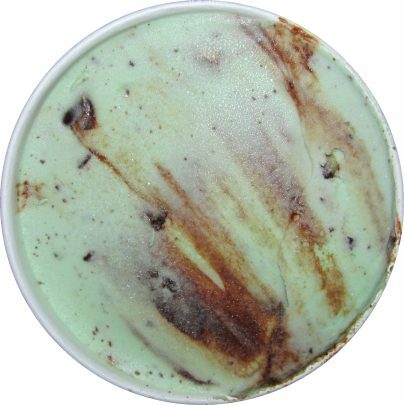 Described as “A mint lover's paradise” Chocolate Shoppe mixes both Andes Candies and Grasshoppers cookies in their green mint ice cream. If that wasn’t enough, they also added a fudge swirl to tie everything together. Before I even try this flavor I know I’m in for a treat. For my money, Keebler Grasshopper cookies are better than what the girl scouts are peddling. I also adore Andes and have always wondered why more companies don’t incorporate them into their flavors. Last but not least is the fudge swirl. If it’s anything like the one in Mackinac Island Fudge, I will be in heaven. Okay, well that just made me drool. I think it’s time to eat! Well this is the first flavor to experience a slight refreeze. Thankfully it’s only the top layer that is affected. There we go, all gone. Now we all know green ice cream will always weird me out but that fudge swirl looks very inviting. Sampling the base alone, I’m hit with that artificial mint flavor that I’ve become accustomed to. 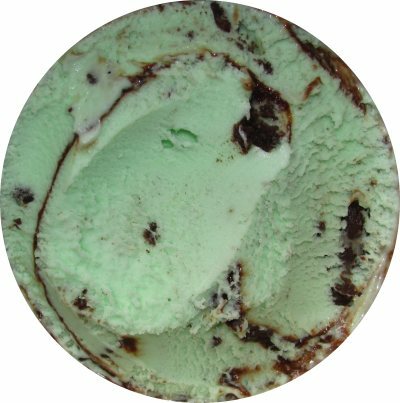 However, the aftertaste results in a flavor more akin to fresh mint like in Talenti’s Mediterranean Mint. If you can recall, I wasn’t the biggest fan of that flavor. Surprisingly though, that grassy mint flavor works well with the artificial one. You start out with a bright flavor and end on a mellower all-natural note. It’s a unique experience to say the least. While I was hoping for a fudge swirl like the one in Mackinac Island Fudge, I got a more liquid but just as delicious swirl. The flavor profile is more along the lines of dark chocolate and works nicely with the base to temper that grassiness. Verdict? If you love mint, this flavor was made specifically for you.